Mastermind Toys Undergoing Treatment for March Madness: While another large toy retailer is teetering on a precipice of uncertainty, Mastermind Toys is right on track with the company’s 2018 growth plans. Canada’s largest specialty toy and children’s books retailer has announced three more stores will open in quick succession this month. Joining the Mastermind Toys family is the newly opened St. Albert, AB location which will be followed by Saskatoon South, SK and Hamilton, ON, for a total of 63 Canadian locations. Since 2011, Mastermind Toys has opened 53 new toy stores, expanding from its origins in the Greater Toronto Area. By the end of 2018, the Canadian-owned and operated company expects to have over 70 stores across eight provinces with 1,300 employees, adding over 45,000-square-feet to its retail footprint. In 2018, Mastermind Toys will invest in consumer-focused digital initiatives, including plans to introduce a new Click and Collect program which gives shoppers the option to reserve online and pick up their order in-store. The company will also launch an innovative and socially conscious loyalty program that will reward and inspire its customers. Cadillac Fairview Blooms Canada-wide with Annual Flower Market: Now that Spring is here, what better way to celebrate than with large floral displays and the occasional 8-foot tall bunny topiaries (perfect for social media enthusiasts, featuring Pantone’s colour of the year – ultra violet). The CF Flower Markets began popping up in Cadillac Fairview shopping centres nationwide on March 17th. These immersive and stunning pop-ups are inspired by the open-air markets commonly found in Europe. Each CF Flower Market welcomes a range of local, independent businesses who do not have storefronts within CF properties -- including beauty brand Flawless by Friday, profiled in Retail Insider last week. Guests will be able to shop everything from flowers to fashion, accessories, seasonal fare, and more. While CF Shops at Don Mills will begin hosting from April 29 to May 13, the markets on the west coast at CF Pacific Centre and CF Richmond Centre are already hosting their markets offering a selection of fresh blooms alongside curated fashion-and-lifestyle items until April 1st. A full list of retailers and hours is available at www.cfshops.com. Video below. 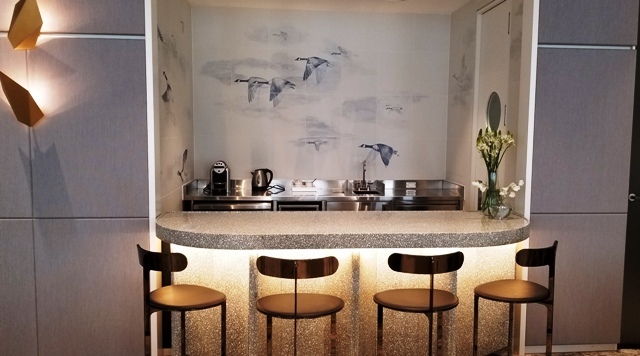 Avenue Road Readies for Traffic in YVR’s Gastown: At the end of January, Retail-Insider reported on Avenue Road, the upscale Toronto-based furniture store, was preparing for launch in Vancouver’s historic Gastown. 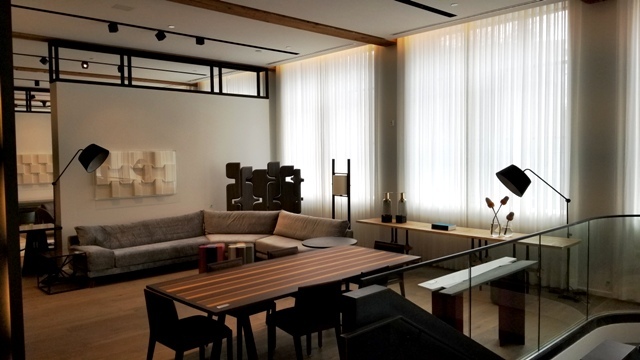 Avenue Road is in great company with new neighbour Fendi Casa Bentley Home across West Pender and Versace Home a few blocks north on West Cordova, the west end of Gastown is now a burgeoning luxury furniture and homewares shopping destination. With savvy Vancouver designers and homeowners always on the search for new shapes and sophisticated pieces, the market is ready for leading design brands that Avenue Road carries. 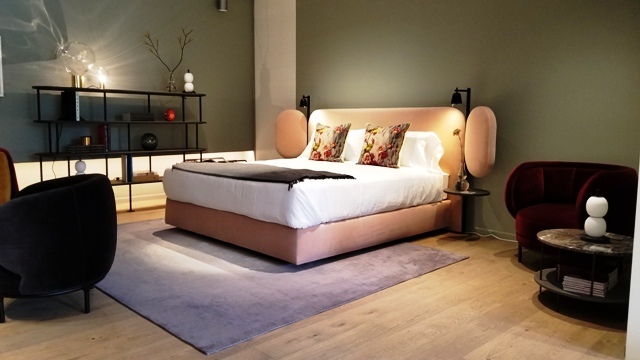 The curated collections include Bruno Moinard, Kvadrat/Raf Simons, and Christophe Delcourt, as well as Canadian designers like Yabu Pushelberg and Moss & Lam. British brand The Rug Company is situated over most of the lower floor with the north corner decorated bright white with fragmented tile-flooring and windows creating an area with a separate Hamilton Street entrance. The pop-up nook is currently occupied by Hanna by Celsia Floral. Retail Insider’s Helen Siwak did a walk-through and shared the advance images above. Salami Company urbanibrands Rolls-Out Vegan NOBLE Jerky®: With over 50 years and 3 generations of family in the salami business, it would seem the future in the meat business for the Urbani family was clearly laid out. Instead, the Port Moody based business forecast a grim outlook on the sustainability of animal-based agriculture and the meat industry. Utilizing years of meat drying technical knowledge, along with some new developments in plant proteins, Urbani Foods developed NOBLE jerky® in four flavours: BBQ, chipotle, teriyaki, and original pepper. A plant protein-based jerky that has the taste, and characteristic tear and bite of slowly marinated and dried beef jerky. The products’ base is tempeh and plant protein, is all natural, and non-GMO. Nobel jerky® is available at MEC nation-wide and online through Amazon, Vegan Essentials, and MEC. NOBLE jerky® is the newest addition to the company’s vegan food line. Also available is a line of flavoured Kale & Quinoa Bites (Mediterranean, Bombay Coconut Curry, Teriyaki, and Rosemary & Lemon), Super Grain Panko, and a family pleaser FiercePop in sriracha, chipotle, and teriyaki. ME to WE India Tea Focusing on Clean Water for India: Youth charity WE has announced a new partnership with DAVIDs TEA on a new initiative that will see them extending their unique brand into India with a new product – ME to WE India tea. Since launching in 2016, the partnership gave 1 year of clean drinking water to over 47,000 Kenyans, and now ME to WE is focusing on India, the second most populated country in the world. DAVIDs TEA and ME to WE are widening the global commitments and recently held a special preview of the ME to WE India tea on the morning of March 19th at the WE Global Learning Centre. Representatives (ME to WE’s co-founder Craig Kielburger and DAVIDsTEA’s Head of Marketing Catherine Laporte) were available for interviews and discussion explored the inner workings of this partnership, and the success that it brought to both companies, and why DAVIDsTEA was the retailer of choice for this. In 2016, Cadillac Fairview partnered with WE and launched the We Store in CF Toronto Eaton Centre. Selling fashion accessories, jewellery, unisex apparel, cards, stationery and gifts, with half of its net profits donated to the non-profit WE Charity (formerly Free The Children). Indochino Looks to Women's Made-to-Measure: The world's largest made-to-measure apparel company for men is looking at possibly getting into womenswear as well as other menswear categories, according to Indochino CEO Drew Green. That's his message from a keynote talk that he gave at the 2018 Thought Leadership Conference, hosted by the University of Alberta School of Retailing at West Edmonton Mall last month. Green explained that in order to do womenswear, the company would "have to do it right" and one of the complexities is that in womenswear, there are dozens of silhouettes. Prior to any women's expansions, Indochino is looking to expand into casual pants and 'untuckit' shirts, with a goal to have more than 100 showrooms in North America. Green explained the brilliance and cost effectiveness of not having to carry inventory in its stores, a differentiating point from most off-the-rack retailers. Indochino launched and established itself online before opening its first bricks and mortar location in Vancouver’s Gastown in 2014 and is continuing to make strides with its immersive and engaging showrooms and its three-week delivery promise on all orders. The company continues to rapidly open showrooms with plans for 18 more in 2018. The world’s largest made-to-measure menswear company, based in Canada, plans to expand its number of showrooms by a whopping 50% this year. The Canadian made-to-measure brand is, for the first time, expanding its assortment to include casual categories, and is also looking to move into made-to-measure women’s wear. Other News: Hillcrest Mall Taps into Consumer Demand, Unique Retail Opportunity, Retailer Writes Novel, Indochino Announces Expansion. The prestigious award recognizes industry leaders who have made extraordinary contributions to retail innovation. The world's largest made-to-measure apparel company, founded in Canada, continues to see exceptional growth both at home as well as internationally. The world’s largest made-to-measure menswear company has opened its second Lower Mainland showroom -- its first mall location in the province. The company continues to see exceptional growth, according to its CEO. The Canadian custom men’s suit retailer, now the world's largest, is entering new regions as it seeks to dominate the market both domestically as well as internationally. The world's largest made-to-measure menswear company has opened in one of Canada's biggest and most productive shopping centres. Tesla Partners with Cadillac Fairview on Expansion: California-based electric car company Tesla will open its fourth Canadian shopping centre location this summer at Toronto's CF Sherway Gardens. Tesla continues to see strong sales in Canada and has partnered with Cadillac Fairview for an expansion with more expected to follow. Sherway's Tesla will be located in the mall's beautiful north expansion that opened in 2015. Tesla will be located next to new Sandro and Maje stores, which are also scheduled to open in several months. The retail space is part of what was once Holt Renfrew, which relocated to Mississauga's Square One in the summer of 2016. Tesla currently operates Canadian stores in Vancouver, Toronto, Oakville ON, Calgary, Montreal and Quebec City. The Montreal store/sales centre is the largest in North America, spanning an impressive 45,000 square feet. The company’s other three mall-based stores are at Toronto’s Yorkdale Shopping Centre (Tesla’s first store in Canada), at Calgary’s CF Chinook Centre, and at Park Royal in West Vancouver.